The stock market is in a constant state of change, so it is only the risk-takers who are involved in careers like this nowadays. 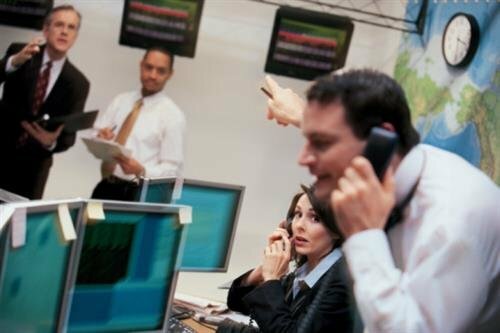 What does it take to be a day trader? What do they do? Sometimes it has been confusing to determine exactly what it means to be a day trader and whether or not it is even a career. It involves the skillful observing and trading of stocks, securities, and other valuable financial assets during a given day on the NYSE (New York Stock Exchange) with the goal being to maximize profit and minimize loss. A day trader is similar to a stock broker, but a stock broker may or may not be the one who actually buys and sells stocks for a client, while the day trader always does. The day trader can actually work for a business or they may work at home as an independent contractor. Unlike many careers in the financial or business sector, day trading does not actually require any formal education. However, it is to your advantage to pursue a formal education in Economics, Finance, or Business, so that you have the best chance of success. Day trading focuses on the buying and selling of stocks, securities, and other financial assets. Some do this with only their own money, in an effort to turn some money into a lot of money. Others make it a business and charge people a commission or a fee, based on how much money they are able to generate for clients due to their trading ability. To be a day trader, you must be a risk-taker, and know how to act quickly and think on your feet. In a sense, it is like "educated gambling." The typical education that is recommend (though not required) to become a day trader is a strong background in Business, Economics, or Finance. The more you know about investing, equity, interest, and financial issues, the better you will be at making wise decisions in a job as a day trader. Since the day trader business is one anyone with some business savvy can do from home, there is no formal education required. It is recommended though that you at least take some courses in Finance or Business, learn the Ethics of the business and stock exchange world, and learn the responsibilities of a day trader from different perspectives. This will better prepare you for the challenges of the situations you may encounter working in this intricate position. 1) Take coursework or get a degree or certificate in Finance, Economics, or Business. The more you know about all of these areas, the better you will be able to handle the finances of clients which will mostly likely result in a profit for them and you. 2) Learn the laws and ethics of trading securities and stocks. It is essential that you follow the rules and laws in order to have a career in this field. If you don’t, you can get into trouble legally with both state and federal legislative entities. So learn what you can and cannot do before you begin the career. It would probably be advisable to try day trading with your own money and portfolio before you begin to take on clients and try making money for them. 3) Learn from stock brokers. Stock brokers have more financial responsibility and background in general, than day traders, though some of the things they do are very similar. You can learn a lot from talking to a successful stock broker, who can advise you in how to do thing right, and how to minimize loss. 4) Build a portfolio. Start your own financial portfolio and practice day trading for yourself first. This will give you important practice in how to do things responsibly. Then once you have made some money for yourself, you can show potential clients what you did and they will want you to try to make money for them. 5) Watch the markets-constantly. A day trader lives and breathes finance and economic trends. So watch the news, read Money magazine, and other financial publications for changes in the market, no matter how subtle. You have to be aware of the subtle changes in order to avoid big calamities. The stock market is in a constant state of change, so it is only the risk-takers who are involved in careers like this nowadays. However, we need risk-takers, people who are confident enough to plow ahead, despite the looming economic crisis. Hopefully, things will get better soon though, and if they do, it will be partly due to day traders, and others who are willing to learn the market and take those chances, so that the overall economy will improve over time. If you would like to be a part of the economic changes that lie ahead, and are willing to learn it well, perhaps you could become a day trader. Start with a strong background in Business and Finance. Get your education first. That is the first step to learning this challenging field and doing it right!